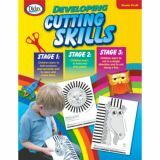 Created by Occupational Therapists and classroom teachers, these books feature easy-to-use worksheets with a wealth of activities to improve spatial, perceptual and motor skills plus developmental milestones that can be used for planning and assessment. 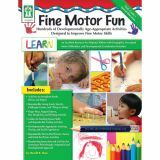 Promote fine-motor development for special-education students in pre-kindergarten–grade 1 using Fine Motor Fun! 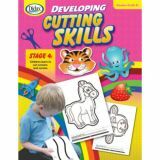 This 160-page resource book is packed with suggestions and reproducible activities that strengthen fine motor and visual perception skills. 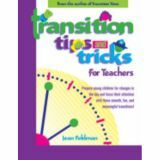 This book supports NCTE and NAEYC standards. Channel children's natural enthusiasm for music and movement into a rich, positive learning experience with this toe-tapping program, featuring music by Greg & Steve. 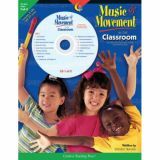 The concise, easy-to-follow lesson plans make teaching music enjoyable for the musical novice and expert alike. Written by Steven Traugh, each book includes two CDs featuring a total of over 30 fun songs. 64 pages each. 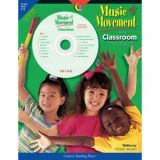 Thirty fun activities and motivating music by Greg & Steve create the magic for this exciting music and movement program! What Colors Did You Choose? What Will We Do When We All Go Out To Play? 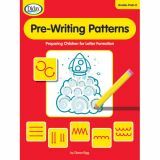 The reproducible activities in this simple activity book present a systematic and fun approach to learning the motor skills and coordination needed to form the six basic patterns that compose all letters. 64 pages. Parents are eager to help their children learn, but teaching young children complicated scientific and mathematical concepts can be intimidating. 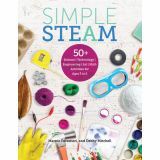 Simple STEAM helps parents realize they don't need to be engineers or scientists to support STEAM learning. 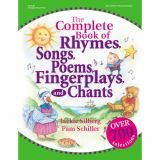 Over 700 rhymes, songs, poems, finger plays, and chants The Complete Book of Rhymes, Songs, Poems, Finger plays, and Chants gives children a variety of ways to fall in love with rhythm, rhyme, repetition, and structural sequence-important building blocks for future readers. The 700 selections will help children ages 3 to 6 build a strong foundation in listening skills, imagination, coordination, and spatial and body awareness. In this giant book of rhythm and rhyme, you are sure to find your own childhood favorites! 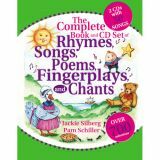 Over 700 rhymes, songs, poems, finger plays, and chants The Complete Book and CDs of Rhymes, Songs, Poems, Finger plays, and Chants gives children a variety of ways to fall in love with rhythm, rhyme, repetition, and structural sequence-important building blocks for future readers. The 700 selections will help children ages 3 to 6 build a strong foundation in listening skills, imagination, coordination, and spatial and body awareness. The accompanying CDs feature 50 songs guaranteed to get everyone up and moving! Over 1,200 Easy Activities to Support Multiple Intelligence's and Learning Styles. 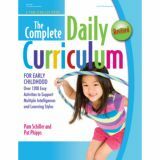 Organized by theme, this book includes a morning circle and end-of-day reflection, and different activities for each learning center. Includes over 1200 activities and ideas to engage multiple intelligence's, assessment tools, and a comprehensive appendix of songs, stories, games and dances, props, recipes, patterns, and more. 416 pages. The Complete Resource Book is perfect to use as a planning guide or as a resource for responding to children's specific interests. The daily plans have circle time, music and movement activities, suggested books, and learning center ideas. The appendix is jam-packed with songs, recipes, and games. This book is like having a master teacher at your side for inspiration all year long. 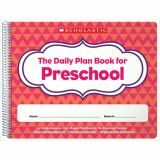 The Daily Plan Book for Preschool! Specifically Designed for the Preschool Teacher! Unique pages for planning early childhood interest centers. Sample plan pages and numerous helpful hints included. 9 1⁄2" x 12". 120 pages. More Than 250 Lesson Plans Created by Teachers for Teachers. This newest addition to the best-selling GIANT Encyclopedia series expands the scope of the series by offering complete lesson plans. 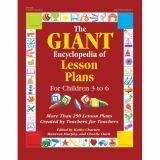 Written and created by teachers, The GIANT Encyclopedia of Lesson Plans has more than 250 complete lesson plans, covering topics from colors and numbers to seasons and nursery rhymes. Each lesson plan is complete with learning objectives, a circle or group time activity, book suggestions, snack ideas, five learning center activities, assessment strategies, and related songs, poems, and finger plays. With easy-to-use lesson plans for more than an entire school year, this book belongs on every teacher's bookshelf! Provides more attention-grabbing, creative activities to provide children with an outlet for wiggles, while giving their brains a jump start with cross-lateral movement games. Grab their attention with songs, games, and finger plays for any time of the day. These classroom-tested ideas are sure to become favorites! 216 pages.